I have been telling everyone and their dog that I am getting an electric car. The Renault Zoe is not a hybrid, 100% electric. Last week the fitting company noted that based on the data and photos we had sent the charger may have to be 'slow' requiring 6 not 3 hours for a full charge. Which would have been fine for my mini commute, but apparently our setup cannot even manage that. What car should I get now? For the Raspberry Pi 3 build I had only a 4GB micro SD card and the standard Raspbian image will not fit on it. So I tried Raspbian Lite. Which gives you a headless(no graphical desktop) Linux install. You can then upgrade it. Most of the steps were taken from a forum thread. but annoyingly the simple program to disable screen savers and blanking "xset" was not installed, so periodically I would have to move the mouse. One thing I did notice about the Pi 3 was there is no spring/catch on the Micro SD card slot. You push it in, you pull it out. Which is great because the old style kept getting bumped, ejecting the card but so subtly that I would not notice and then spend ages trying to understand why it did work and now it does not. Worst instance of that was at work, where the Pi worked at my desk but in the process of mounting it behind a TV the card got ejected. Spent almost a hour trying to find the Pi on the network. So I got a Raspberry Pi 3 and what do I do with it? Run my TopBlock screensaver from 2005. Which seems a little vein until you find out why. 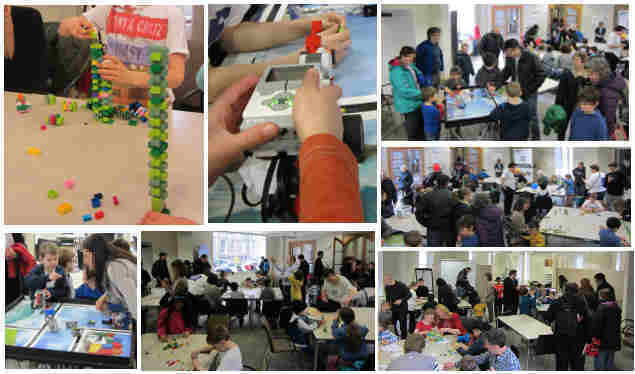 We were presenting at the Cambridge Science Feastival and it was all about Lego. As Lego towers featured heavily, a Raspberry Pi just showing my screen saver of falling blocks that pile up was ideal. I was also demoing First Lego League using Lego mindstorms robots with kids to complete challenges, so I had another Raspberry Pi running omxplayer in a loop with videos about the First Lego League. It was a little bit busy and for 6 hours straight I had queues of kids wanting to have a go with the robot and the last hour still had at least one child trying to have "another" go. Bottom line was everyone had fun and the organisers have invited us back, we also got a lot of positive feedback from the parents. The whole family worked together and I was only able to take these pictures because Joseph was showing kids how to do the Lego mindstorms. To get the screen saver running full pelt I enabled the new experimental OpenGL support. We went to the Raspberry Pi Party and had lots of fun. Sadly no Pi Zeros were for sale though just about every vendor was displaying one or two. Did manage to get a Pi 3 but have so far used it literally as a Pi 2. We did the Sensory Overload workshop which was using the Sense Hat. Especially liked the workshop format; Basic intro, "what is this wire for", sense hat workshop walk through, followed by "select the worksheet you are interested in". Kids loved it. I bought a number of other cheap bits like a Drum Hat, Cambridge Edu Kit 3 (robotics) and a couple of the new MagPi books. We also won a Pibrella board and the foundation gave everyone another copy (latest version) of "Adventures in Raspberry Pi". As before the kids went free and it was only fiver for me. We missed out on party tickets but that just made the more manageable. Two complaints, but very minor. 1) the Cafe does not offer anything kid friendly or anything cheap. But the bottom line, as with last years party was it was FUN! and everyone was really friendly to talk to.